Chamber Members & Non-Members In Attendance Had A Chance To Answer "What Can the Chamber Do For Me?" Bill Roten of RCB Bank gave a brief history of the bank which began in 1935. 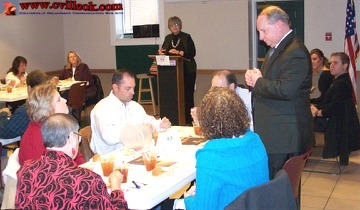 RCB Bank was the luncheon sponsor for this Chamber meeting. RCB Bank (which is now in many communities including Collinsville) has assets of more than a billion dollars. A variety of topics were shared Thursday at a meeting dedicated to Chamber self-evaluation. The comments and suggestions came from local business owners (some thriving and others struggling just to pay the rent/payroll each month). Most praised the existing postive aspects of the Collinsville business environment while challenging the Chamber/community to make improvements. Promotion of Collinsville and it's many businesses was a common theme but exactly how to best accomplish that is still in the works. Creating a complete list of services and items available for sale in Collinsville is one of the first set objectives. How that list is most effectively made available is not yet set (some combination of printed and online media). Suggestions were made for improved newcomer interfacing (welcome wagon, information sheets, etc. for new residents and ribbon cutting, advertising / promotions, evening meetings, etc. for businesses). The discussion and suggestions will continue at the April 3rd noon luncheon meeting which will be held at American Bank of Oklahoma. The purpose of the Collinsville Chamber of Commerce is to help foster alliances within the business community, to enhance and support economic development, and to provide leadership for the continued growth of Collinsville. The Chamber strives to be very involved with community affairs to create a bond between its citizens that will empower the entire Collinsville community to prosper and grow together.